Union de Vecinos started in 1996 fighting against the demolition of the Pico Aliso public housing projects. Years later we have grown to a Network of Neighborhood Committees promoting economic and environmental justice, civic engagement, preservation of housing, and building healthy and stable community neighborhoods. We do this through community organizing, popular education and direct action. In our model, solutions to a problem are developed by those most affected - community - this is what drives us and is at the heart of our work. 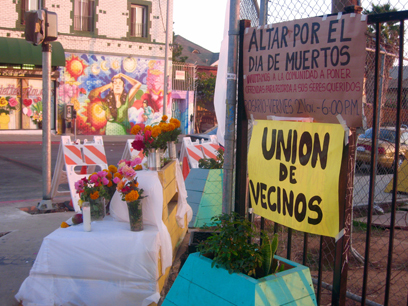 Union de Vecinos, through its Neighborhood Committees, organizes local clean-ups, murals, custom bench designs, community-wide cultural celebrations, stop lights and cross walks for safety, solar powered lighting in areas with no light posts, and many other initiatives that improve the quality of life in Boyle Heights and Maywood. Union de Vecinos leverages 20 plus years of experience in community organizing and coalition building in the development of future community leaders. Community leaders are residents who invest their time, energy, and passion into leading campaigns, meeting with their local councilman, organizing protests, and building a base of support in their community through local Neighborhood Committees. Union de Vecinos has spent 20 years working with communities in Boyle Heights and Maywood to make government work for its low income citizens. 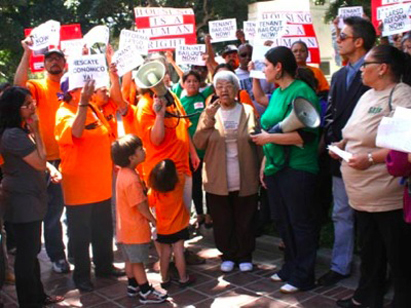 Through community organizing and strategic partnerships, Union de Vecinos has fought to maintain the integrity of these neighborhoods by ensuring that appropriate housing and public space addresses the needs of the people. 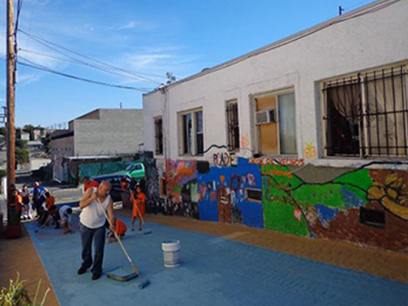 A donation to this fund will help us organize 5 local neighborhoods to transform alleys, streets, and other public spaces into community serving places for community members to gather, impacting 500 residents. Designate your donation for our “Eviction Prevention Fund.” This fund will help us organize 5 local neighborhoods to fight eviction and displacement in Boyle Heights. Your donation will improve the lives of 500 low income families. Add you voice to our community and help us build a movement. As a member, you’ll receive a free Union de Vecinos t-shirt, a membership card, and a monthly newsletter with information about the local social justice issues in Los Angeles. We are parntering with POWER (People Organized for WEstside Renewal) based in the west side of LA, to build a movement that preserves neighborhoods and puts the political power back into the hands of communities.